Temperature measurement usually takes place in cities, which retain more heat than rural areas. 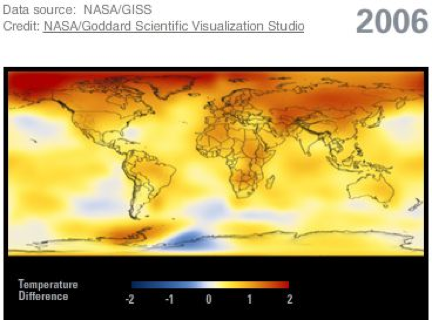 Even when you account for the urban heat island effect, it's clear that the Earth is getting warmer. The Urban Heat Island Effect (UHI) is a phenomenon whereby the concentration of structures and waste heat from human activity results in a slightly warmer envelope of air over urbanized areas when compared to surrounding rural areas. It has been suggested that UHI has significantly influenced temperature records over the 20th century with rapid growth of urban environments. 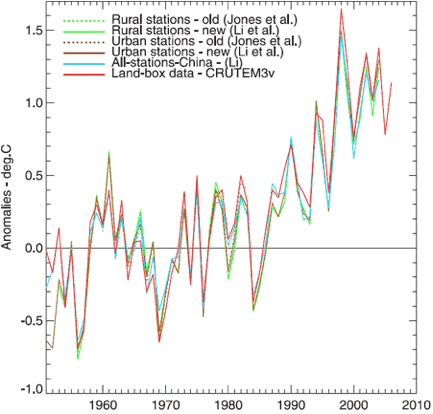 Scientists have been very careful to ensure that UHI is not influencing the temperature trends. To address this concern, they have compared the data from remote stations (sites that are nowhere near human activity) to more urban sites. Likewise, investigators have also looked at sites across rural and urban China, which has experienced rapid growth in urbanization over the past 30 years and is therefore very likely to show UHI. The difference between ideal rural sites compared to urban sites in temperature trends has been very small (Figure 1). Figure 1: Annual average temperature anomalies. Dotted green and brown lines are from a dataset of 42 rural and 42 urban sites. Solid green and brown lines are from an adjusted dataset of 42 rural and 40 urban sites. The blue line is a non-adjusted set of 728 stations, urban and rural. The red line is a land-only data set. © John Cook. Modified from Jones et al. (2008), Journal of Geophysical Research, 113, Figure 6, D16122, © 2008, doi:10.1029/2008JD009916. Another way to explore the UHI would be to look at where the majority of warming has occurred across the globe. The UHI should match where most people live. However, if you look at the 2006 global temperature anomaly (Figure 2), you find that the greatest difference in temperatures for the long term averages were across Russia, Alaska, far northern Canada and Greenland and not where major urbanization has occurred.